GEMMA REDUX pieces are never precious - the metals are generally not delicate but rather industrial, and the stones are rough and intense. Intentionally tough and complex designs made for the tough and complex girl - the GEMMA Girl. Gemma Redux had a custom built website and came to us to move her website into an easier system for her team to manage. Product Fly-In: Each jewelry product flew in upon each page load for a visually exciting look. Product Display: Instead of a product page, the product opens in a box and swing-loads the product shot and the detail shot. Special URL Treatment: Because of the unique nature of the product boxes, special programming had to be created in order to load a product directly. Announcement Box: An announcement box loads on the home page when the Gemma team loads it with the latest press feature, sale, or other announcement. They can turn it on or off. Press Page with Product Features: The Gemma team can load in new press items. When a new press piece is added, they can add a linked picture of the product being featured. OMNE Collection: The OMNE collection is unique to Gemma Redux. Inspired by Jessica Alba who deconstructed her Gemma necklace, these pieces are long chains that can be worn in several different ways. 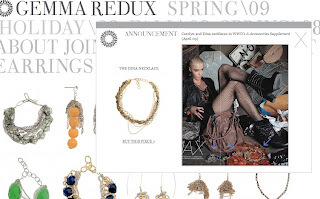 Website Traffic Spikes: We were with Gemma Redux the first time she was featured on Daily Candy, and the first time she was a featured deal on the Today Show. The website design had already been established by an outside designer.